"Do you know how did coffee-houses start?" If we want to find the first record of a public place serving coffee we have to go to the Turkish city of Constantinople (now Istanbul). In fact in 1475 the first coffee shop saw the light: Kiva Han. Coffee was such an important item during that time period, that it was legal in Turkey for a woman to divorce her husband if he could not supply her with enough coffee. Turkish coffee was served strong, black and unfiltered. The idea of drinking coffee with cream and sweeteners, came into fashion in Europe around 1529, when the first coffee-house in Europe was established. Vienna was invaded by the Turkish army, who left many bags of coffee behind when they fled the city. Franz Georg Kolschitzky claimed the coffee as the spoils of war and opened a coffee house. He introduced the idea of filtering coffee, as well as the softening the infusion with milk and sugar. The beverage was quite a hit, and when coffee houses also started serving sweet pastries and other confectionary treats, their popularity exploded. Coffee establishments continued to spread, with the first one opening up in Britain in 1652. Though its popularity was growing in Europe, the idea arrived in England again from Turkey. An English merchant who dealt in Turkish goods (such as coffee) had two of his servants leave him, to go into business for themselves. "The Turk's Head" coffee-house was born. It was in an English coffee-house that the word "tips" was first used for gratuities. A jar with a sign reading, "To Insure Prompt Service" sat on the counter. You put a coin in the jar if you wanted to be served quickly. 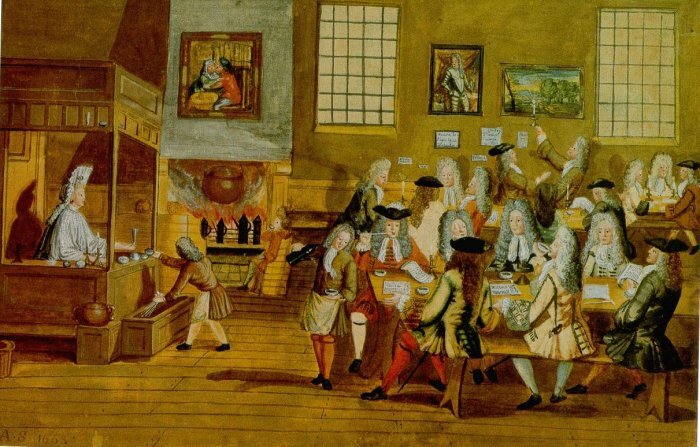 The British called their coffee houses, "penny universities" because that was the price for the coffee and the social upper-class of business-men were found there. In fact, a small coffee shop run by Edward Lloyd in 1668 was such a business hub, it eventually became the still-operating Lloyd's of London insurance company. From there, the idea spread further through Europe. Italy in 1654 and then Paris in 1672. Germany embraced the coffee-house for the first time in 1673. When America was colonized, the coffee-house was quick to follow. The role of the American coffee house was the same as those in England: the hotspots for the business community. The Tontine Coffee House (1792) in New York was the original location for the New York Stock Exchange, because so much business was conducted there. Nowadays globalization has reached the coffee houses too.This is the age of Starbucks, the largest American coffee-house company in the world with 19.972 stores in 60 countries. It is an Anglo Italian fusion of styles which has become a hit everywhere. What would Franz Georg Kolschitzky say if he could see how his creature has changed in time?